Meatballs is not quite the right word. In Russian, тефтели (pronounced: tef-teh-lee) is the name for meatballs that contain a large portion of rice or potatoes in addition to meat. This recipe uses turkey meat, which is lower in fat and has a milder flavor than beef. To make up for this mildness, I went overboard with herbs and spices, so the taste is actually bursting with flavor: the ground turkey is indeed bewildered, and bewildering to the taste buds! 1. Cook the rice that will go into the meatballs. 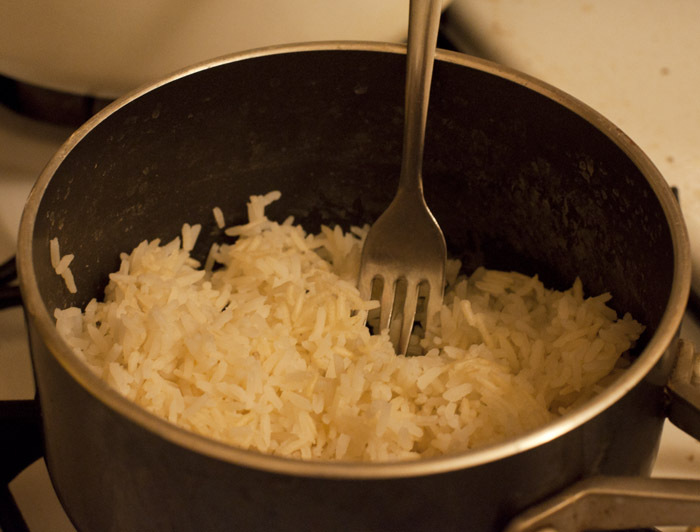 This is how I do it: Wash rice in cold water, drain, add 3/4 cups water and set on high heat in a little covered pot. Let it boil for 2 minutes, add salt, mix, put the cover back on and lower heat to low. After 15 minutes, turn the heat off, but do not open the lid until 10 minutes later. Fluff with a fork and let cool. 2. Combine ground turkey, eggs, shredded parsnip, cooked rice, white pepper, salt to taste (~1/8 tsp), 1/2 cup breadcrumbs. Mix very thoroughly. 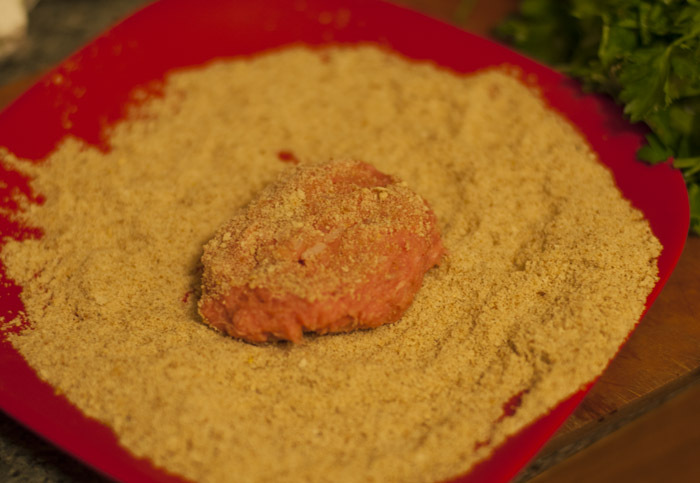 If you find that meatballs are pulled apart as you fry them, just add more breadcrumbs to the mix. 3. Pour about 3 Tbs oil into a pan and set on high. 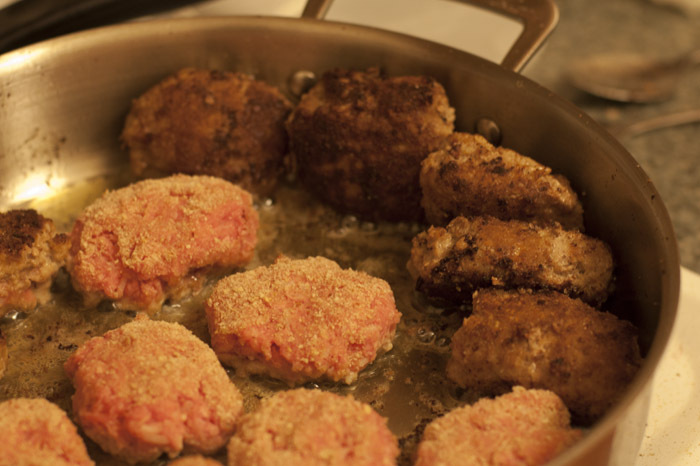 While the oil is heating, shape the meatballs: scoop about 2 Tbsp of meat at a time, shape a flattened patty with your hands and dip into a plate of breadcrumbs on both sides. 4. Fry the meatballs on medium-high heat until nice and brown. 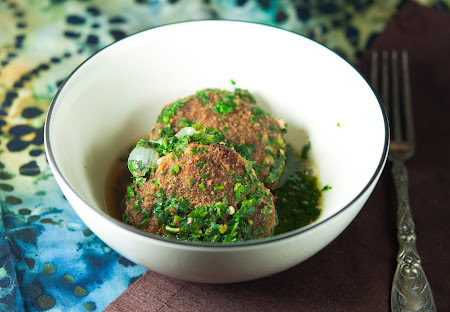 Turn each meatball from its "stomach" to its "back", and then let it stand vertically on its side, rotating it occasionally until the sides are nice and brown too (doesn't have to be perfect!). You can support these vertical meatballs using the ones that are still frying on a flat side (see photo). As you fry, add oil if needed. There should always be a thin layer of oil in the bottom of the pan. When browned, transfer meatballs to a plate. 5. 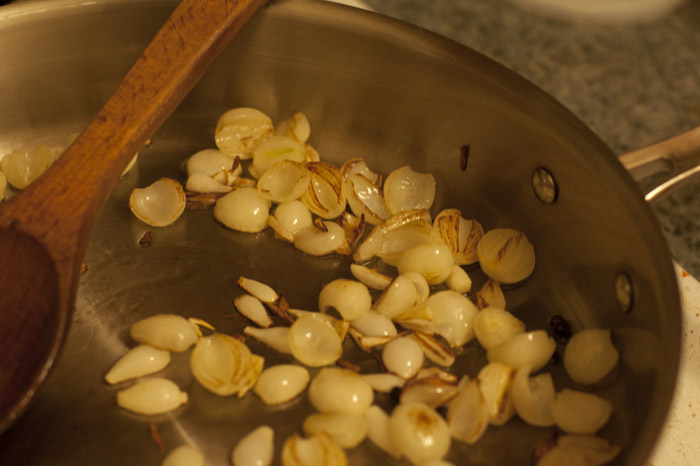 Wash the frying pan, add 1.5 tbsp oil and saute the onions. When the onions are browned, add pilsner, broth and salt (if needed). Arrange the meatballs in the pan, and if they are less than half covered in liquid, add a bit more broth. Turn on medium-low heat, cover and let simmer for 15-20 minutes. 6. Finely chop parsley, cilantro, serrano pepper and basil in a food processor. There should be 1-2 cups of greenery, loosely packed. Add this mixture to the pan, gently mixing most of it into the broth. Remove the pan from heat and let stand covered for 1 minute to let the herbs heat up and release their aroma. 7. Serve meatballs in a bowl with some of the cooking broth, to allow for very delicious dipping. Bewilder your senses, and savor this country taste! I used parsnips in the ground meat mixture instead of the usual onions, and this worked exceptionally well, because unlike onions, parsnips retain more of their flavor when cooked.